Day 4 and the last day at SVP. After this, we will return to our regularly scheduled sorts of posts.Another day of talks and poster sessions, the last chance to meet friends and colleagues and discuss what you’ve heard and what people are doing. Although frankly, I think most people are tired and ready to go home by this point. Some people thrive on the highs of shared creativity and knowledge and find the end of the meeting and going back to regular work depressing, I think the most common reaction is the feeling of being rejuvenated by the meeting, so that you can’t wait to go back and start developing the new ideas created at the meeting, the chance to put those creative juices to work before the distractions of everyday life dry them up. A lot of people don’t like having their talks on the last day. People are going home, they are tired, their attention flags, but this meeting showed a strong turnout for the last set of talks. The symposium scheduled for today was “Patterns from the poles: biodiversity and paleoecology of high latitude fossil vertebrates,” which I, at least, found interesting and worth attending. I didn’t attend too many of the talks though, because there was also a session on the evolution of early birds, which I found even more interesting, as well as a session on mammals, which had several talks discussing how different mammal groups adapted to climate change in the past. Several talks introduced new fossils and what they contributed to our knowledge of evolution within those groups, such as a new Devonian fish from Siberia, the first pterosaur from Antarctica, a new sauropodomorph (early versions of animals that would become sauropods, the oldest mammal from Antarctic and a new Arctic camel, new birds, seals, sirens, dolphins, and whales. All in all, good reasons to stick around. 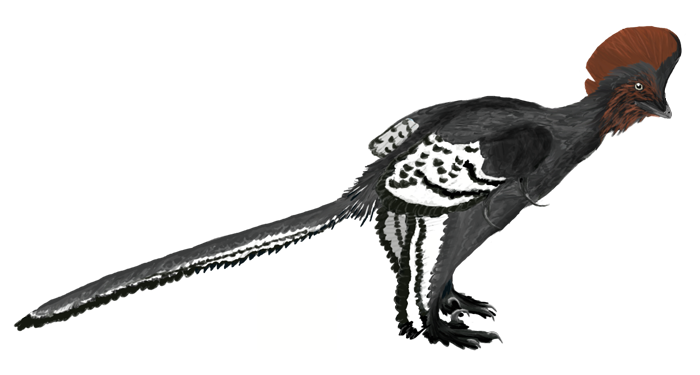 Rui Pei reported on a new specimen of Anchiornis, the first animal in which fossil evidence in the feathers was used to determine coloration. Anchiornis lived 10 million years before Archaeopteryx and there has been some debate about whether it was a true bird or still a non-avian dinosaur. Pei’s analysis of the new specimen indicated that Anchiornis was a troodontid, so not quite yet a bird. This is another great example that the transition between birds and other dinosaurs is so well documented that the line is an arbitrary classification with no biological relevance. Speaking of feather colors, William Gearty found new ways to study the melanosomes in the feathers providing colors, finding that, in addition to color, he could tell color gradients as well. he also concluded that melanosomes stiffened the feathers, making them more resistant to wear, but also carried more bacteria, thus representing an additional resource cost for the animals (some of this work can be found online at PLOS One).. Justin Hall found that feather asymmetry, long thought to be important for flight, turned out not to have the aerodynamic significance we thought, as it didn’t really affect the ability to fly. Ashley Heers found trade-offs in locomotor ability: the more investment in wings, the less was put into the legs, and this trade-off could change as the bird grew so that chicks may emphasize the wings or legs while the adults emphasized the other. 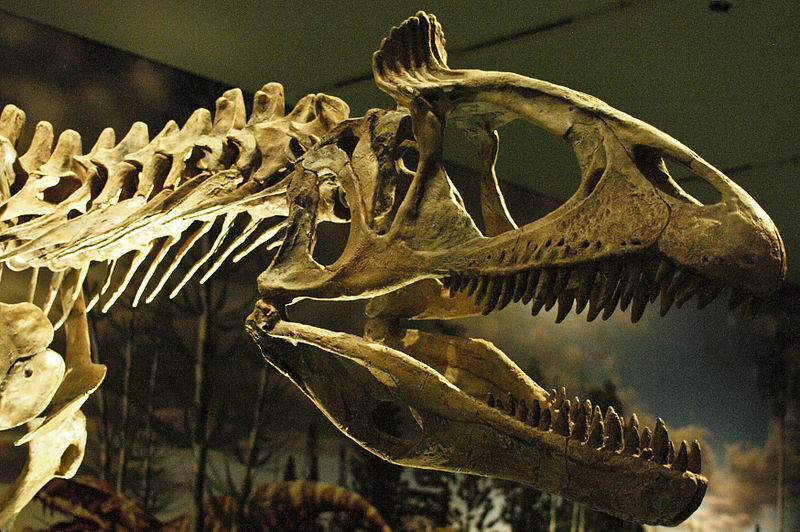 Cryolophosaurus, Royal Ontario Museum. Wikimedia. Several studies showed the difficulties inherent in paleoecology interpretation. Peter Makovicky found that the horned ceratopsids showed different growth rates between northern and southern populations, the duck-billed ornithopods did not, and the carnivorous theropod Cryolophosaurus showed different growth rates in different areas of the same body in the northern individuals, but not in the southern individuals. According to Bergman’s rule, we should expect to see animals get bigger and stockier the farther north they are found. 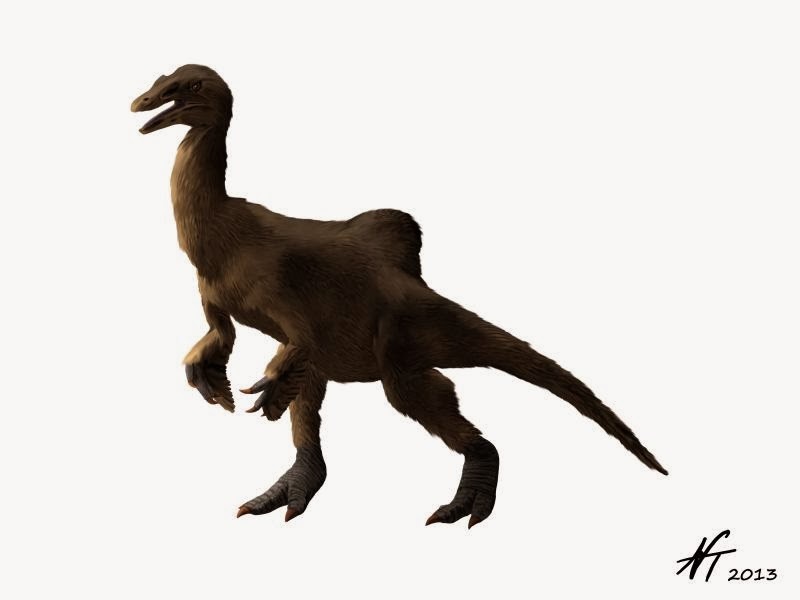 Anthony Fiorillo found that the small troodontids followed the rule, but northern individuals of the large tyrannosaurs were only 40% the size of the southern ones. In this case, it is likely that resource supply kept the tyrannosaurs smaller. Patrick Druckenmiller reported on a diverse Arctic dinosaur fauna including toodontids, dromaeosaurs, thescelosaurs, hadrosaurs, pachycephalosaurs, and tyrannosaurs, despite mean annual temperatures near freezing. While similar to southern forms, all the species were different, indicating a discrete, provincial ecosystem. John Tarduno argued that the presence of champsosaurs (a type of early crocodylian) and turtles indicated the weather was too warm for ice to be present even during winter, but as proven by an earlier talk, we know this is incorrect (a great example of science correcting itself). He proposed volcanism forming a series of shallow, freshwater connections between North America and Asia during the latest Cretaceous allowing interchange between the continents, which will need more study to determine if that proposal is true. 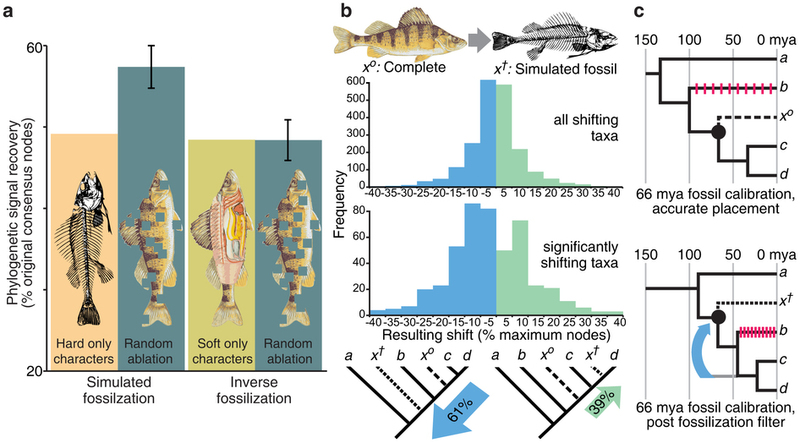 Judd Case found that even though modern fish fauna show a drop in diversity with lower temperatures, thisi was not the case in the Cretaceous. As the temperature in the Cretaceous dropped 8-10 C in the Antarctic oceans, the fish didn’t really change, although marine reptiles increased in diversity while the ammonite diversity dropped. Figure from Fletcher et al. 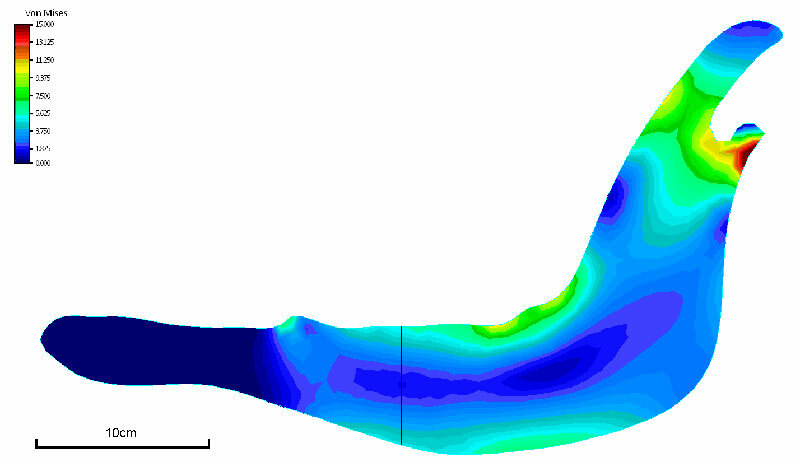 2010, showing FEA analysis, indicating stress points near the joint. Rodrigo Figueiredo presenting evidence that predators who pursue their prey (as opposed to ambush predators attacking large prey and those that pounce on smaller prey) may not have evolved to go after herbivores, but to prey on the pounce predators themselves, much like wolves will sometimes hunt foxes and weasels. Michael Greshko presented a study finding that herbivores known as generalists (able to eat a wide variety of plants) mostly consist of different individual specialists who eat only a narrow range of foods. This is rather like why a pizza buffet needs to stock a lot of different types of pizza even though any particular customer may only eat one or two different types. 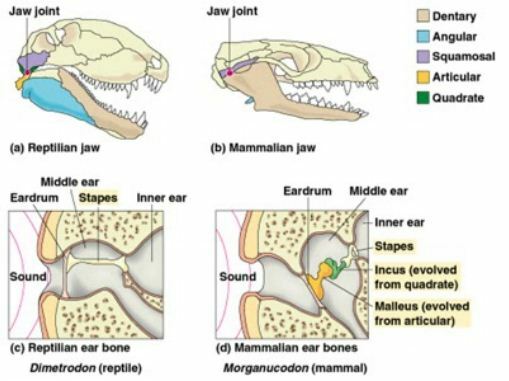 Speaking of eating, Emily Rayfield gave a possible answer to why mammals reduced the number of bones in the mandible to just one, as opposed to having several bones in the lower jaw like other groups of animals. Using Finite Element Analysis, an engineering method designed to test mechanical strength of materials, found that the one bone provided a stronger bite while reducing stress. Alistair Evans used a program called GEOMAGIC to study tooth shape in early mammals and predict what tooth shape should be like to help sort out all the isolated teeth for which we have no idea what they belong to. in this way, he is making predictions of fossils that have not yet been discovered. In addition to the software programs mentioned previously, several others were mentioned in talks this day. Most biogeography methods these days are done using phylogenetic methods to help inform how animals spread out across the globe, but Chris Sidor presented Bipartite Occurrence Networks (BON), using Gephi to visualize the patterns, which just uses locality connectedness and found that therapsids (proto-mammals, aka mammal-like repties) were pretty widespread and cosmopolitan before the Permian extinction event, but became much more provincial and limited in range afterwards. Paul Upchurch used TREEFITTER to map pterosaur biogeography, finding support for sympatry (speciation within the same region) with an origin in eastern Asia. Diego Pol used Ancestral Area Reconstruction methods to conclude that dinosaurs probably originated in South America, along with most, but not all, mammals, but crocodylamorphs originated in China. Graeme Lloyd used GEIGER to study evolutionary rates and Akinobu Watanabe used PERDA (Polymorphic Entry replacement Data Analysis, a script running in TNT, a phylogenetics analysis program) to simulate poor sampling of phylogenetic data, finding that if a trait, or character, has multiple possibilities within a single species, it seriously messes up results unless multiple individuals covering all the possibilities are included in the analysis. John Alroy found that no current method is very good for finding the first appearance of taxa, but Bayes Theorem methods, such as used in MrBayes, produce better estimates of extinction times. Figure from Sansom and Willis 2013 showing fossilization study results. The last two talks I would like to mention are from Robert Sansom and David Grossnickle. Sansom found that loss of soft tissue characteristics resulted in changes in cladograms drawn from the data for vertebrates, but not for invertebrates. In other words, if one only looked at hard parts, the evolutionary relationships changed, and more often than not, made the animal appear to be more ancestral than it really was. This occurred even if the characters were recorded as unknowns and not simply listed as absent. Grossnickle looked at morphological disparity in Mesozoic mammals, i.e. the diversity of body form. What he found was that most Mesozoic mammals were carnivorous/omnivorous, with a low level of diversity which gradually increased until the middle Cretaceous. At some point in there, they hit a botttleneck. Their diversity crashed and, while it did start going up again,never reached the previous diversity levels until after the K-T extinction event. What is interesting about this is that pretty much everything else was diversifying, while mammmals were not. Another interesting thing about this is that according to molecular data, mammals were diversifying, so the apparent diversification did not show up as morphological diversity. This is the end of my discussion about the science presented at SVP. There were so many more talks and posters that I did not mention and i make no claim that the ones I mentioned are even the best or most important, nor are they even all the ones I attended and learned something from, but it would take me until the next meeting to discuss all of them. The point is that meetings like this are incredibly fascinating places to see what is going on in science right now. Anyone who thinks science is a bunch of stale facts in textbooks or that scientists even pretend to have all the answers is seriously mistaken. The search for truth is asymptotic, you can get ever closer to a totally clear understanding of reality, but you will never reach it. Science is all about going over the data, tossing out ideas that don’t succeed and developing ones that do, with each step opening up new avenues of exploration. I will end this discussion with the awards banquet held on the evening of the last day. During this banquet, we are told how much the auction collected to support the society, important news, memorials for those we lost recently, and people are recognized for their hard work and contributions to the field of vertebrate paleontology. Students are awarded their prizes and scholarships they have won, artists are awarded for best art in different categories, and people are recognized for outstanding careers that have progressed the field. This year, one of the biggest awards went not to a scientist, but to a science advocate. 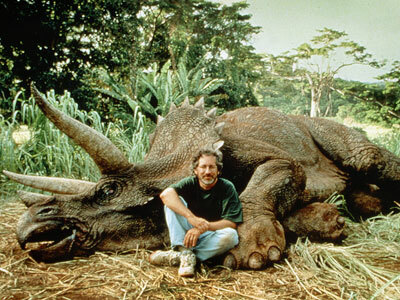 Perhaps because the meeting took place in Los Angeles, special recognition went to Steven Spielberg, for the money he has donated to the Jurassic Foundation and other places to support paleontology research and education and for the Jurassic Park movies, which brought paleontology to the center of the public eye and has inspired many to enter the field and make their own contributions. Officially, the meeting ended here. There was an after-hours celebration, which is always fun from what I hear, but I was beat and had a plane to catch early in the morning, so I called it a day. Until next year! Another day at SVP, another boatload of information. Some may be wondering why I am devoting several posts to this meeting,when it may seem not as relevant to the general public. Fair question. people not actually doing science in an academic setting rarely get a chance to see anything about what it is like. Science is often presented as a list of facts, but that is only part of the story. Science is a dynamic endeavor, never being satisfied with an answer, always working on the things we don’t know and revisiting the things we thought we knew to see if they still hold up under the new information. Science gets things wrong all the time, but this process of study and review and critical examination reduces the margins of error. Not all things that are wrong are equally wrong, rejecting evolution in its totality is a whole other category of wrong compared to disagreements about the rates of evolution in a particular lineage. No one in science who examines the evidence seriously disputes evolution or that dinosaurs existed, but exactly how evolution works, how dinosaurs lived, exactly who is related to whom; these are questions that people struggle with. With each new study, the path moves closer and closer to the truth, each time having the possibility of opening up whole new avenues of exploration we had never thought of before. That is what these meetings are all about, bringing minds together for new solutions to old questions and for finding new questions to ask about old solutions. What goes on at meetings is a glimpse behind the curtain of published papers and distilled textbooks, putting human faces onto that quest, faces that are, more often than not, students working together and with more experienced people. Most science is done not by white-haired old men in the lab, but by young, energetic students with a zest for learning. And there is so much more to do. In the previous two days, there were collections of talks called symposiums, devoted to specific topics, such as on ontogeny and the la Brea tar pits, including a preparators symposium on fossil collection and preparation techniques. Friday included a special symposium on the tempo of evolution and dating the fossil record. Samuel Bowring presented the EARTH-TIME Initiative, an opportunity to date the stratigraphic record to a precision never before seen, allowing measurements as refined as +/- 20,000 years all the way back to Triassic times (>200,000,000 years ago). That is a resolution of 0.01%. The remaining talks were about research on specific areas and times contributing to that increased precision. Terry Gates looked at cranial ornamentation in theropod dinosaurs, finding only larger theropods used bony ornamentation and that if a lineage developed it, the lineage quickly developed larger species. So the question now is why were bony cranial ornaments only selected for larger body sizes? Yuong-Nam Lee reported on new fossils of Deinocheirus, an enigmatic fossil previously known only from one set of huge arms, which allowed them to determine it was the largest ornithomimosaur ever found, sporting a large sail on its back near the hips, something like a small spinosaur sail. Picture a giraffe-sized ostrich, with a sail on its back, giant arms with huge claws, and a big,chunky tail. On second thought, maybe not so much like an ostrich, after all. Other dinosaur reports include Ashley Morhardt, who reported that Troodon had the largest encephalization quotient of any non-avian dinosaur (i.e. it had a big brain). Most of its brain was made of the cerebrum, which not only makes a reasonable case for it being the smartest dinosaur, but supports a mosaic model of brain evolution, meaning that different parts of the brain evolved at different rates. Amy Balanoff discussed the evolution of oviraptorosaur skulls and brains, showing larger cerebrums than most other dinosaurs, but reduced olfactory tracts, so they were similar to birds in having a relatively poor sense of smell. 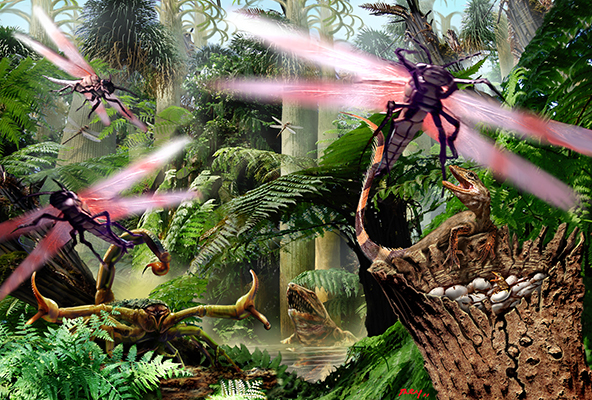 Walter Persons reported on fossils showing that Microraptor ate mostly fish, as well as small mammals and birds. A session devoted to mammals had several interesting talks, such as one by one by Ross Secord, who concluded from his research that the body size increase seen in horses was related to warmer temperatures allowing an longer growing season causing increased availability of grasses, making up for the lesser nutritive value of grasses compared to other plants. I would argue however, that a shift to eating hard-to-digest grasses would result in increased body size not through increased availability, but to increase digestion efficiency. Horses are what is known as hind-gut fermentors, which is less efficient than the foregut fermentation seen in ruminants such as cows. This mode of digestion is more efficient at higher body sizes, allowing more time for digestion. Lindsey Yann found that horses were too much of generalist feeders to be useful for paleoclimate reconstructions, but different camel species were more specialized and could used to make determinations of relative aridity and plant cover. Rebecca Terry found that interactions between mouse species had at least as large an effect on population sizes as climate, with different species reacting differently to resource changes. Thus, there is no easy answer to predicting how species will react to climate changes because they cannot be looked at without understanding interactions throughout the entire ecosystem. Much of this sort of work uses MIOMAP and FAUNMAP, which are similar paleontology databases to the Paleobiology Database, but limited to mammals in North America and so may be more complete for these types of studies. 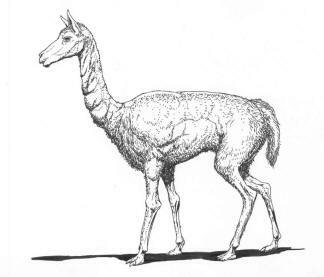 Hemiauchenia, an early North American camel. Drawing by Gavin McCullough. Brady Foreman discussed ways to interpret the completeness of the fossil record based on river deposition patterns and Patrica Holroyd discussed the “missing marsupial problem,” finding that because most eutherian mammal fossils are identified to species level and most marsupial fossils cannot identified beyond “marsupial,” there is a taxonomic identification bias in the literature and thus, species diversity studies. Three other studies I would like to mention are about archosaurs, the “ruling reptiles,” including crocodilians, dinosaurs, and birds. Brandon Peecook looked at the bone microsturucture of Nyasaurus, which was either the earliest known dinosaur or the closest basal archosaur to it, and found that it had elevated growth rates compared to other reptiles, indicating that all dinosaurs may have had faster growth rates from the beginning. John Sarrazin reported that crocodilians and birds both use unidirectional air flow through lungs,as opposed to bidirectional like mammals, which uses a completely aerodynamically controlled system with no structural valves, so in all likelihood, the ancestral archosaur had these characteristics as well. Finally, Jennifer Nestler found that cold weather is not what limits the range of alligators. Rainfall contributed more than 60% to range limitations, most of the rest comes from warm weather during the summer providing long breeding seasons. Only 0.4% of the factors limiting their range could be attributed to cold weather limitations. Something to think about as global warming causes longer summers with elevated rainfall in the eastern United States. At the end of the day, after the talks and the poster sessions, this is the day for the annual auction, to raise funds for the organization that can be used to fund research and travel grants for students in the upcoming year. The auction consists of two parts, a silent auction and a live auction. In the silent auction, everyone has two hours on which to bid on the objects they want and the last bidder wins, much like alive version of eBay. The auction is filled with a wide array of donated items, everything from rare books and artwork to hand-knitted dino-themed baby socks, whatever people are willing to donate. After the silent auction comes the live auction, usually filled with more expensive, one-of-a-kind items, such as original artwork or the original copy of O.C. 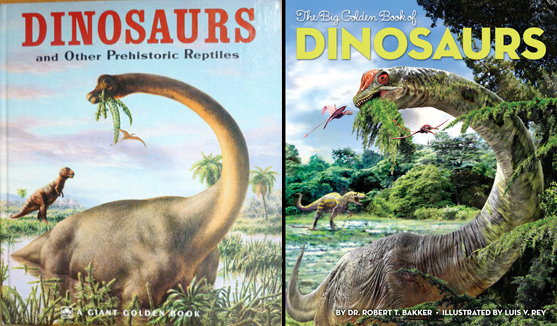 Marsh’s dinosaur monographs. I have even seen the services of a field cook and her personal field kitchen for a season get auctioned off. The auctioneers always have fun with it, usually dressing up in costumes. 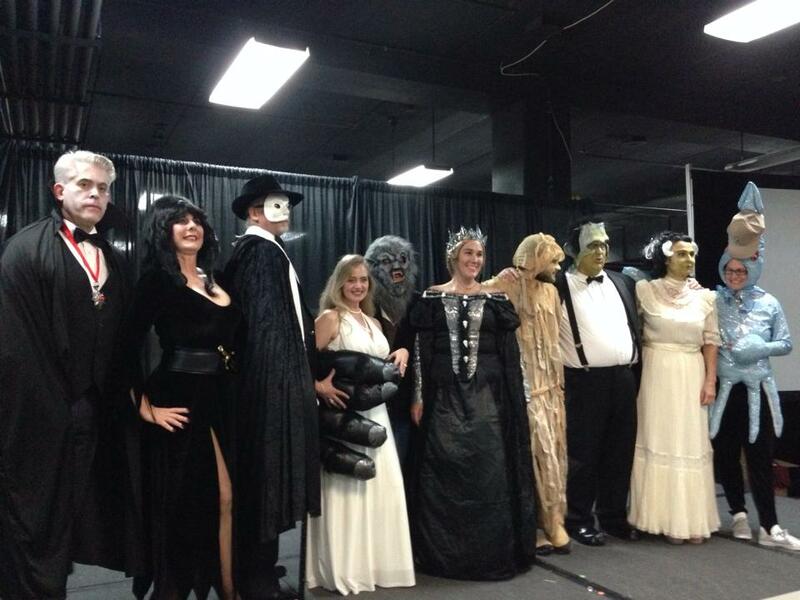 you never know who is going to be serving as auctioneer, it could be a zombie, King Tut, or Superman, but regardless, it is an entertaining spectacle. Auction committee for SVP 2013. Photo by Neffra Matthews. An end to another day, only one more day to go, before everyone packs up to go home, or off to their next meeting, or a museum to do research, wherever their path leads them. Another day, another long list of talks and posters to see. Here is a brief synopsis of the talks I attended. I only wish I had the time to fully discuss everything that went on and all the material covered, but that would take volumes of material and far more time than I have. As before, if any of the talks sound sufficiently interesting that you want more information, please ask and I will discuss them in more detail. I realize that there are a lot of terms and creature names that may not be familiar to all readers, but the greatest learning takes place when one asks questions, so ask and ye shall receive. 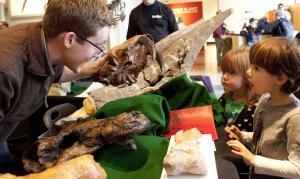 Adam Huttenlocker showing fossils to kids at the Burke Museum. Photo by Lara Shinn. The big session for today was for the Romer Prize. Alfred Romer one of the most influential vertebrate paleontologists of the 20th century, so every year, SVP awards the Romer Prize to the best presentation by a predoctoral student. A student usually applies within a year of completing their PhD. Those that successfully apply give a talk in the Romer session at SVP, which are voted on by the prize committee and awarded at the end of the conference. It is the highest honor a vertebrate paleontology student can win and so is quite an honor. This year went to a friend of mine I went to grad school with by the name of Adam Huttenlocker. The first Romer talk I attended was by Stephen Brusatte, who talked about theropod dinosaur phylogeny, finding that while there is good support for a number of relationships in the theropod lineage, we still don’t have a good handle on how the early coelurosaurs, such as tyrannosaurs and ornithomimids, fit into the theropod family tree. 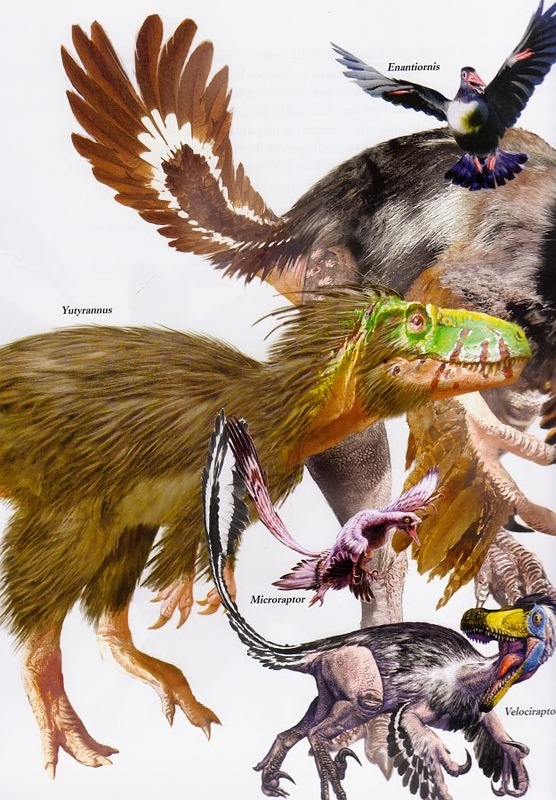 He was able to conclude, after a detailed analysis of birds and their closest nonavian dinosaur relatives, that there is no real distinction to be made between them that truly delineates birds from other dinosaurs, giving further support to the dinosaur-bird hypothesis. Nevertheless, once birds did evolve, they evolved quickly, rapidly diversifying. Stephanie Drumheller looked at bite marks to see if you can tell the difference between crocodylians by what damage they leave on the bones. Thomas Evans looked at literally thousands of bones in rivers and found that what we have traditionally expected bones to look like after being carried downstream did not really match the reality at all, forcing us to have to rethink our assumptions of how much we can really say about fossils based on their condition. 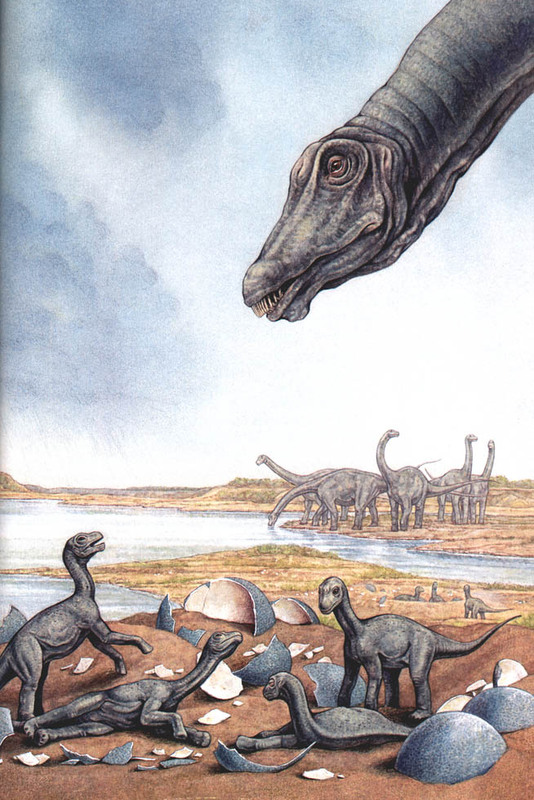 Adam Huttenlocker examined the “Lilliput Effect” after the Permian extinction. It has been noted that after mass extinctions, animal body sizes decrease, but exactly why that occurred was unclear. What Adam found was that selective extinction of the larger, faster-growing groups was the best explanation in this case. One might ask what other possibility might there be, which would be that all the animals simply got smaller, with some going extinct, but Adam found that smaller species did not alter their size through the extinction, they just survived when the large, fast-growing species died out. Neil Kelley was able to determine, in large part, the diet and feeding behaviors of most ichthyosaurs based on their morphology. Stephan Lautenschlager did a detailed study of therizinosaurs found that having beaks reduced stresses on their jaws and their famous giant claws were likely used to hook and pull vegetation, not for digging or fighting (at least, not primarily). 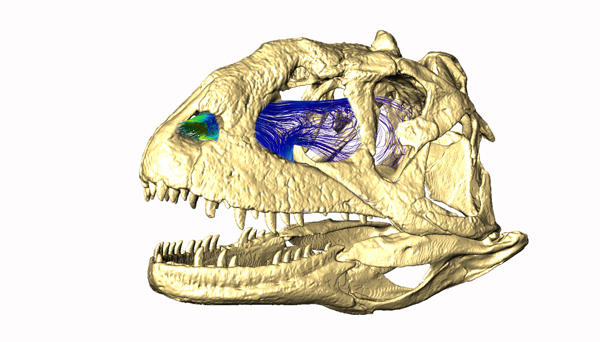 Yasuhisa Nakajima used 3D micro-CT analysis to determine changes in bone growth and how much that can tell us about growth in extinct animals and James Neenan provided the first complete phylogeny of placodonts, the earliest group of marine reptiles. Blood supply in the turkey. By William Porter. Dinosaur noses got a lot of attention this meeting. William Porter mapped blood circulation in the dinosaur Camarosaurus, A.W. Crompton studied the evolution of turbinates in the nasal passages of early therapsid mammaliforms, indicating that they may have originated as a countercurrent heat exchanger to help regulate body temperature. 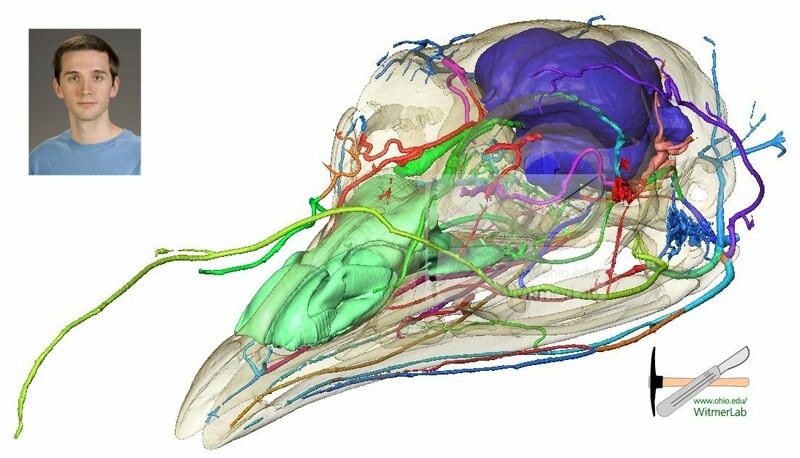 Tomasz Owerkowics also discussed the role of turbinates in mammals in thermoregulation, but found they do not serve that purpose in birds or other reptiles. Along the way, they discussed the evolution of the different breathing apparatuses in mammals and reptiles. Robert Eagle also looked at dinosaur thermoregulation, but did so using carbon and oxygen isotopes measured together, which indicated a mammalian level body temperature for sauropods, but somewhat lower for oviraptors (although still higher than modern reptiles). Having large brains is often linked to higher metabolism and both ornithomimimosaurs and troodontids have been considered to have large, almost avian-like brains, but Harry Jerison found that at least their forebrains, while large for most dinosaurs, were still lower than avian forebrains. Going back to therapsids and the permo-triassic extinction, Jennifer Botha-Brink found that therapsids showed reduced life span and earlier reproductive maturity after the extinction event, consistent with what one might expect from populations that lived through an ecological catastrophe with reduced resources. In strictly morphological evolution studies, Gabriella Sobral found that the fenestrated middle ear, which helped improved hearing capabilities, was not a unique event, but evolved independently six times within dinosars alone and was even rather inexplicably lost in stegosaurs, ankylosaurs, and oviraptors. Henry Tsai looked at hip joints in saurischian dinosaurs and found the femur did not fit the hip socket very well, indicating a lot of soft tissue must have been present in life and that the amount of soft tissue increased as the animals got bigger. Nicholas Campione came up with a new way of estimating body mass for bipeds to get around the fact that the standard equations were designed for quadrupeds and don’t work all that well for bipeds. It turns out that a simple correction factor of the standard equations worked fairly well, simply multiply by the square root of two. now to figure out just how well that really works and why. One potentially confounding factor is that it was based on living birds. I doubt it would hold true if used on say, a kangaroo. Finally, the last talk I want to mention was by Kevin Padian, who after discussing the earliest known bats, proposed that they never glided, but instead used their early wings to make a fluttering, control descent from trees. In his view, bats evolved from mostly terrestrial forms that ran up into trees to avoid predators (much like Dial‘s talk of the previous day), were insectivorous, and jumped out of trees to flutter farther and farther distances. He openly admitted this part was currently speculation and will need much more evidence before it should be accepted as definitive, but was a plausible hypothesis which can be tested, which I think is the mark of a good scientist, clearly delineating between what we know and what we think, between fact and a possible explanation. So what of this, if any, looks interesting to you? What would you like to know more about? I attended the annual meeting of the Society for Vertebrate Paleontology (SVP) last week. This is the yearly meeting where those studying anything with a backbone, from fish to furballs get together to talk about what they have been doing and see what others have found (although admittedly, most of the press goes to dinosaurs). Over the next few posts, I will share brief snippets of what I learned. If you read anything that sounds particularly interesting to you and would like me to discuss it in more detail, just let me know in the comments section and I can expound on the topic. So what does a scientific meeting like this look like? There is always a dealers’ room, where you can find an array of book publishers, such as Indiana Press and CRC Press, and supply companies, such as Paleo-Tools and Bone Clones, and many others all hawking their wares. You will meet artists such as Luis Rey, learn about what’s going on at different publications, such as PLOS One, and upcoming meetings. There are the business meetings, social events, and award banquets. There are field trips to local paleontolgical sites (this meeting was in Los Angeles, so the La Brea tar pits and the Los Angeles Natural History Museum were highlights). There is also the chance to converse with paleontologists from all over the world, a venue wherein colleagues can talk face-to-face and forge new connections, where students can get their feet wet presenting at an international conference and talk to students of other professors to learn about potential graduate and post-graduate opportunities, which professors make good mentors and which ones to avoid. And of course, there are the talks and poster sessions, where you can hear about the research people are doing right now. If you want to know the current state of the field, this is the place to go. Every day for four days, three sessions run concurrently, each covering 16 talks a day, plus over 120 posters are presented every day. By the end of which, if you haven’t found enough new information to send your brain into overload, you simply haven’t been trying. This is also a relatively small meeting, with only 1500 or so attendees, unlike some scientific societies which have meeting attendances over 20,000. 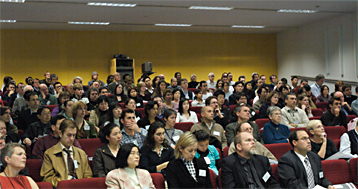 Bosch Institute Neuroscience meeting, 2007. This is a bad design for meetings. Please, just stop. Before I get into a short recap of the talks I attended (there were many more I would have liked to attend, but I have not yet perfected cloning myself), I will digress a moment for a quick comment about the meeting room setup. My first thought upon seeing the room arrangement was Happy day! All the meeting rooms are right next to each other; not on a different floor, on the other side of a giant building, in another building, or in another facility entirely, unlike some other meetings I’ve attended. This makes popping from one session to another to see different talks much easier. The downside to this is that hundreds of other people all have the same idea and are trying to go through the same hallway, trying to get around the other attendees who are chatting with friends and colleagues. For those of you that are accustomed to New York subways, this is no big deal, but for some of us, it can be a bit claustrophic as personal space shrinks to microscopic proportions. The other rant I have is that, after all this time, they still have not learned how to lay out a room for the talks. They insist on preparing the rooms as though everyone will calmly file in before the talks and sit there until the break, providing long rooms with the speaker at one end and two long columns of interlocking chairs set in rows up to 20 seats long. however, this is a scientific meeting with many short talks. people stream in and out constantly. So what happens is that all the edge seats are quickly taken and great, yawning chasms of emptiness are left in the center. Why no one ever thinks to place the speakers in the middle of a long wall, with many columns of seats with no more than 6-7 seats to a row, allowing ample space for people to move, is beyond me. They might not be able to put as many seats in, but that hardly matters if no one can get to the seats in the first place. Now on to the talks! In the first session, all the talks dealt with the problems of ontogeny in interpreting the fossil record. Ontogeny, how an animal grows from fertilized egg to old age, can cause several problems in the fossil record. When all you can see is a fossil, it can be very hard to tell if you are looking at an adult or juvenile. Many animals can change so much during development that the juveniles can look like completely different species. Hans Larsson presented about a possible way to figure out rough ages of an animal by looking at how different bones in the skull covaried, or how they changed shape in relation to each other as they grew. Jack Horner warned against assuming an animal is full-grown unless you have solid evidence of that from the bones across the skeleton and Mark Goodwin showed how difficult that can be with pachycephalosaurs, but Holly Woodward found that at least some dinosaurs reached sexual maturity long before they reached “adult” size and in fact, never stopped growing, so it is important to keep in mind just how one defines “adult.” David Evans showed the problems of using juveniles and adults in the same phylogenetic analysis, in that the relationships of species identified using juveniles were very ambiguous and unstable, often showing up as more ancestral than an adult of the same species, sometimes substantially so. John Scannella found that using just one juvenile specimen of Triceratops in a phylogenetic analysis resulted in that specimen not being identified as a ceratopsian at all, but if a sufficient number of juvenile specimens of different ages were included, they all fell out together in their expected relationship. This indicated the ontogeny problem can be dealt with if you have enough samples, as well as indicating what characters are newly evolved versus being evolutionarily stable. 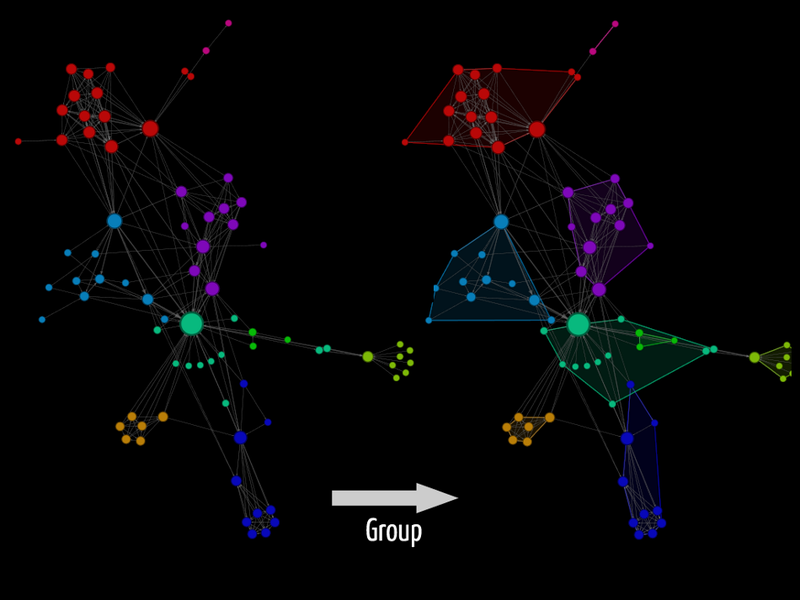 Zachary Morris extended this to show that not all individuals grow up the same way, there was no set pattern of development that all individuals within the same species followed to adulthood, so trying to order specimens into an ontogenetic sequence requires a large sample size. Also, contrary to an earlier research that got a lot of press, Torosaurus is probably not the same species as Triceratops. 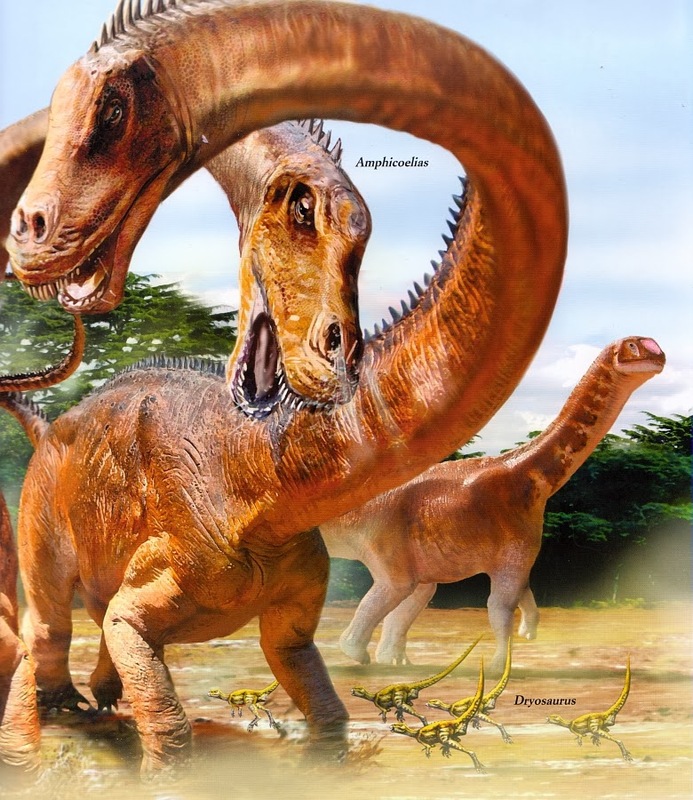 Robert Reisz showed very fast growth in prosauropod embryos and P. Martin Sander estimated that sauropods could grow to sexual maturity in 16 years, attaining 90% of their maximum size within 32 years. This comes out to an average growth rate of 4 kg/day, which is similar to modern large mammalian herbivores, but he cautioned this was likely overestimating the ages and underestimating the growth rates. Ken Dial discussed the role of predation in the development of flight, with evidence indicating that if predation pressure was relaxed and there was sufficient food resources, birds commonly became flightless.He made the interesting point that everything is a transitional environment; that to truly understand an organism,one has to examine all aspects of their habitat and you can’t afford to get to narrowly focused. Denver Fowler found that animals occupying different niches at different ages were more susceptible to extinction. Caroline Stromberg found that, contrary to popular belief, the development of grasslands didn’t actually correlate very well with high-crowned, hypsodonty teeth. Sandy Kawano looked at how locomotion changed between fin and feet and found that the total forces between front and hind limbs was fairly constant, but acceleration came from the pectoral fins at first, but as the hind limbs developed, more of that motive force came from the hind legs, with the front legs taking on more of a regulatory role guiding maneuverability. Karen Sears found that limb evolution became more modular, in that different parts of the limb evolved at different rates and times, so that each part could be considered as evolving relatively independently, with higher levels of evolution near the ends of the limbs. 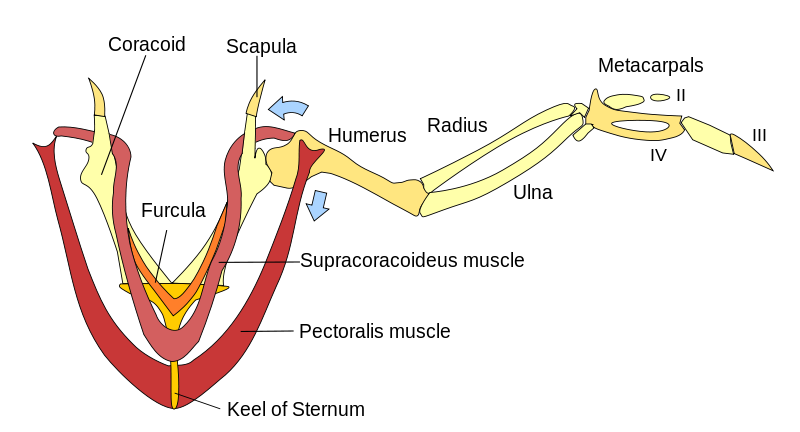 Paul Sereno discussed the evolution of the coracoid bone in the shoulder and how its loss in almost all mammals created a more flexible and faster, but weaker joint. He opined this is why bats don’t grow to the size of birds or pterosaurs and that it allowed dinosaurs to get bigger and carry more weight than mammals. Ali Nabavivadeh reported on his studies on the evolution of jaws in ornithischian dinosaurs, finding they talked the problem in a variety of different ways. Lucas Spencer noticed that all early ornithischians were in Gondwana and that dispersal explains more of their biogeography than vicariance (speciation via the emergence of physical barriers). Mark Loewen reported on the biogeography and phylogeny of ankylosaurs, while Victoria Arbour discussed the evolution of the ankylosaur tail club. Philip Currie reported on the smallest known articulated ceratopsid fossil, while Andrew Farke reported on ceratopsian biogeography. Thomas Carr found evidence to support anagenesis (direct ancestor-descendant relationships) in some tyrannosaurs, but not all, while Brandon Hedrick found that fossilization processes made one species of psittacosaurs look like three different ones. Jordan Mallon found little evidence in pachycephalosaur skulls to indicate they lived in upland areas, as is often stated, and Jason Bourke did some very nice computer modeling showing how turbinates (structures within the nasal passages often associated with endothermy, aka warm-bloodedness) work to channel air through nasal passages,using that to find support for respiratory turbinates in pachycephalosaurs. This all only recounts brief snippets of the talks I attended on the first day and doesn’t include the many posters I looked at. I will cover Day 2 in my next post. If you want more information on any of these snippets, leave a comment and I will be happy to expound upon them.